How unequal is the UK – and should we care? 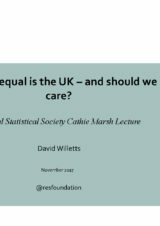 David Willetts’s slides from the Royal Statistical Society Cathie Marsh Lecture, exploring recent trends in UK living standards and inequality, specifically inequality between generations and between graduates and non-graduates. The slides also explore attitudes to inequality. 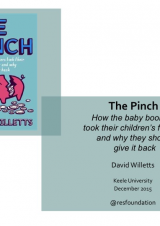 The accompanying slide pack for David Willetts’s speech to Keele University, exploring the differences between the baby boomers and younger generations, looking at wealth and welfare in particular.